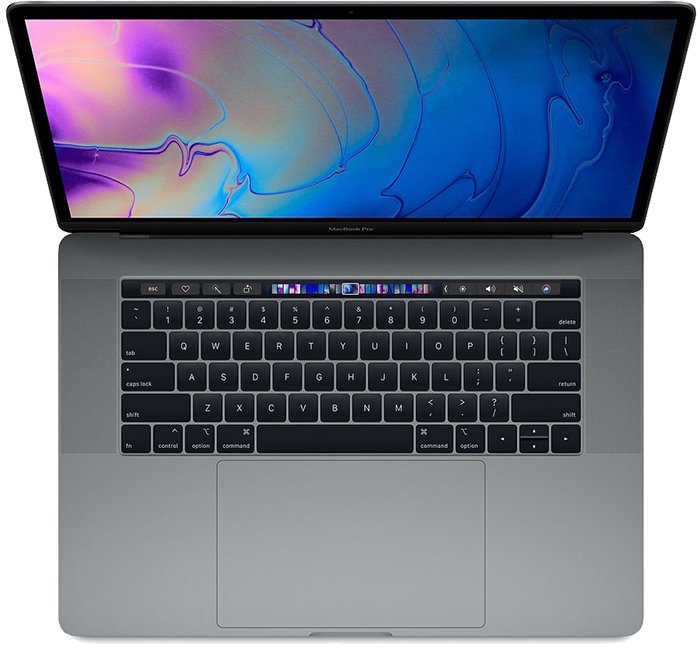 Apple is exploring a new keyboard design that could eventually replace its butterfly switch MacBook keyboards and finally solve the problem of "sticky" or inconsistently functioning keys. Issues that Apple has acknowledged can occur with some current MacBook keyboards are widely believed to be caused by dust or other particulates getting lodged in the butterfly mechanism underneath the keycaps, which are shallower than those on previous-generation MacBook and MacBook Pro keyboards with traditional scissor switch mechanisms. In its 2018 MacBook Pro models, Apple quietly introduced a thin silicone membrane underneath keyboard keys, which is an attempt to solve the issue of dust and crumbs from getting stuck. But a new patent suggests the company is researching a totally new approach to the way keyboards are designed that could eradicate the problem for good. Published last week by the U.S. Patent and Trademark Office and first spotted by AppleInsider, the patent application called "Computer with keyboard" describes a keyboard that replaces movable keys with a glass sheet that includes raised sections to designate the tactile location of individual keys. When a raised key section is pressed, the keyboard detects the input pressure for that key and processes as a typical key press. The concept differs from the featureless plain of a virtual onscreen keyboard because the raised sections allow the user to feel where their fingers should rest in relation to the individual keys. The patent describes how an additional level of tactile feedback could be provided by a raised side wall around individual raised keys that could deform with each press, while an underlying layer could serve to "push" the key back into place. Meanwhile, key symbols could lie on a separate later underneath the glass panel, which would make it easier to change the layout for different regions, languages, or even applications. 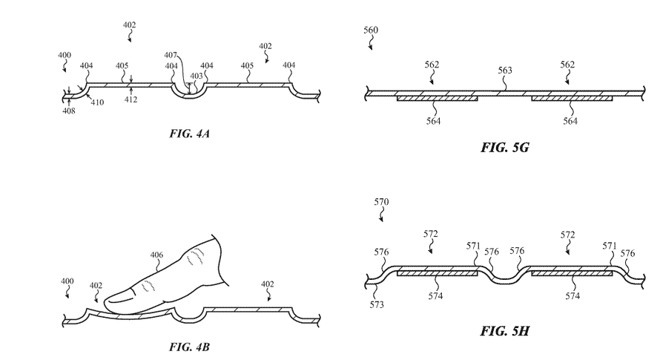 The patent also proposes using side sections around the keyboard that could double up as a trackpad. As expected, the glass keyboard could have the effect of making the keyboard thinner and allowing more room for other components to be housed in the notebook chassis. Apple has filed patents for keyboards in the past, included one that uses a touchscreen panel similar the Touch Bar, but that extends to the entire keyboard layout, but this is the first patent to emphasize the use of individually raised glass elements that mimic traditional tactile feedback. What about the fact that the new keyboards are terrible to type on for longer periods of time? Apple went from the best keyboard design in the industry to the worst in a single year. Dumb. Why don't they just go back to the previous keyboard design on the 2015 MBP's? It was perfect! If it ain't broke, don't fix it. Well, now it's broke. I'd gladly take a modest increase in thickness in exchange for getting the previous generation keyboard back. Edit: And based on those above that beat me to the submit button, I'm clearly not alone. If it ain't broke, keep reinventing the wheel until it is. ...or...use the keyboard mechanism from 2015 MBP, maybe ? ooh even less travel. Possibly 0 travel keyboards. Nothing says touch typing like a total lack of tactile feedback. I think I need to stock up on some of the old desktop keyboards before they disappear. The keyboard from 2008-butterfly was by far the best keyboard I have ever used. Seems strange they forgot how important keyboard feel is. HCI is supposed to be apples wheel house. The easiest solution is to take a step back and return to the 2015 design - who would care other than a few people within Apple who would have to eat humble pie. Pushing on with glass keyboards is just going down the rabbit hole of excessive design for the sake of it - now at the expense of durability and therefore device longevity. This is leading to massive costs on a relatively simple but fundamental component of a laptop. Solve the keyboard problem by eliminating the keyboard. Genius. They’re progressively moving away from the keyboard we want. Apple really should just swallow their pride, admit they made a mistake, and kill the touchbar and butterfly switches. I promise not to recklessly throw around "I told you so's".